Memorial Day Weekend signals that the warm weather of summer is just around the corner. Students are counting down the days until summer break and parents are making the family vacation plans. Most people plan to spend this weekend outside attending barbeques with friends and family. However, all of this means increased traveling and congestion on our roads and the AAA Foundation wants to remind you that even in the midst of Memorial Day excitement, safety needs to be a priority. Driving in beautiful weather with the windows down and sunroof open can make the shortest drive across town seem like joyful experience. However, drivers need to be careful because there is the potential of an increasing number of distractions as people start to spend more of their time outside. It’s simple; one minute you’re waving to a friend that is walking on the sidewalk and the next you’ve rear-ended the car in front of you. This example would be a minor incident but make no mistake, distracted driving in any form can have serious consequences. Distraction isn’t the only thing drivers should be conscious of during the holiday weekend. Afternoon barbeques also means there will be the temptation to drink and drive. Drunk driving is not a game and a DUI, or even worse a serious accident, will ruin anyone’s holiday weekend. Drowsy Driving is also something people should watch out for this weekend, specifically anyone making a longer drive out of town or planning to drive late at night. Memorial Day is a time to remember all of the people who have lost their lives serving our country. Let’s honor them by making responsible decisions and protecting the lives of each other while we’re on the road this weekend. Driving south along the SR 99 Alaskan Way Viaduct, you may have noticed a lot of really big things in our construction zone: gigantic cranes, towering columns, huge machinery, and colossal trucks. These are the tools needed to build sections of the new bridge that will replace the viaduct’s south end. 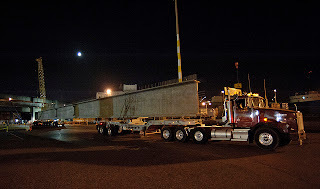 On May 19, something even bigger arrived and was added to this gargantuan list – “super” girders. For a quick lesson in Bridge Building 101, girders are simply support beams used to support the roadway of a bridge. 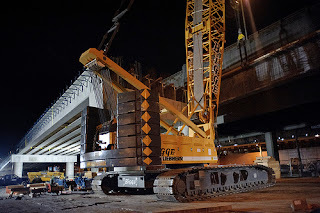 They serve as the heavy duty backbone connecting the bridge columns and form the base underneath the new roadway you’ll soon be driving on. Girders vary in length, depending on the amount of space between the columns. The smallest girders we use are about the length of an articulated bus – the double-length ones that bend in the middle. 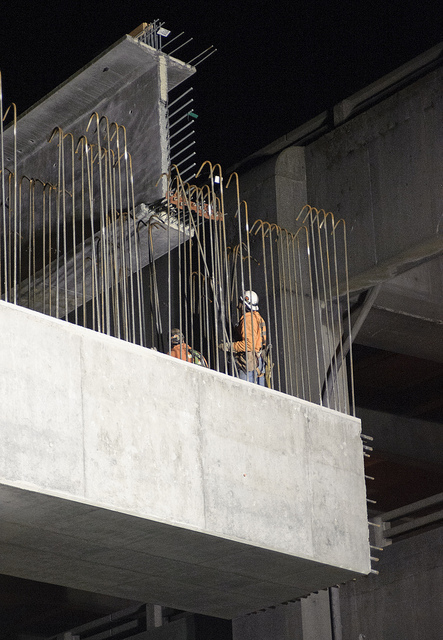 However, several of the girders we’re using to replace the south end of the Alaskan Way Viaduct are the largest ever produced in Washington state. Weighing in at 127 tons a piece, these “super” girders stretch to a length of 205 feet. That’s as long as a Boeing 787 Dreamliner. 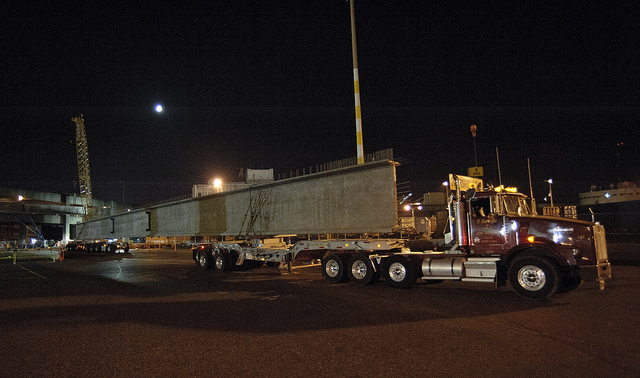 Each “super” girder is custom manufactured in Tacoma and transported on a truck specially-designed to hold the weight. Due to their size, the girders must be transported to the construction area and set into place during the middle of the night to avoid shutting down major downtown routes. Once the girders arrive on site, crews use two cranes to set them on top of the new bridge column. The girders will span the intersection of S. Atlantic Street and Alaskan Way S. and the railroad tail track, near the entrance of the Port of Seattle’s Terminal 46. This intersection sees a lot of activity – including freight trucks, trains, commuters, bikes and pedestrians. Using “super” girders to span the intersection avoids placing new columns where they may affect traffic flow through the intersection. We’re proud of our “super” girders. On the viaduct, they make all the difference. A lot of behind-the-scenes planning goes into highway work zones that will have a significant impact to traffic. There are meetings, phone calls, e-mails, written drafts, corrected drafts, and eventually final drafts of news releases, all of which are sometimes pretty much washed down the drain by the whims of Mother Nature. We can plan all we want, but in the end, a lot of the materials we use to improve our highways are weather-sensitive, which makes it difficult to pinpoint exact schedules. A good example of this is the upcoming I-5 Clover Creek Bridge Deck Project in Pierce County. Overlaying the bridge’s deck and replacing approach slabs requires two extended weekend closures (up to two lanes closed Friday night through Monday morning), and two weekends of Friday and Saturday night lane closures. That’s four weekends of construction. It was scheduled to begin in April, which has five weeks, so the work could have be all done by May, right? As you saw with April's weather, it didn't match what we needed to get the work done. The work, which includes overlaying the bridge deck with a modified concrete that has rapid-cure latex in it, requires at least 45 degrees and no rain. So, as April showers continue into May, we could be in for even more delay. But what makes some projects subject to weather while others march forward like the U.S. Postal Service through rain, sleet and snow? If all or even a portion of a project requires dry weather, then that’s exactly what’s needed to get the job done so that the significant investment of tax dollars results in the long-term performance we expect. It’s also why no one paints the exterior of their house in the rain. Some projects here are very similar to this – paint striping, concrete placement, asphalt paving, compacting embankments, and even putting down traffic buttons all use materials that need certain temperature and moisture conditions to ensure success. Concrete and asphalt don’t cure or compact well if temperatures are too cold and painting or putting down traffic buttons in the rain generally makes a mess, which is a waste of time and money. Our job is to get the word out so travelers can plan ahead and defer as many trips as possible during high-impact construction projects and minimize the backups. We alert the media, post notification throughout our website, make hundreds of phone calls and send numerous e-mails asking drivers to avoid the impacted area. We try to provide as much notice as possible and monitor weather forecasts like nervous brides planning an outdoor wedding prior to the event, but even with our best efforts, sometimes work is cancelled late in the game because of last-minute changes in the weather. So, what can you do to help us out and still get where you need to go? Be flexible if your summer plans include travel through upcoming work zones. All of the planned highway summer construction is available at www.wsdot.wa.gov/construction/2011. A weekly look at impacts is available at www.wsdot.wa.gov/construction. If rescheduling your trip is not an option try to find an alternate route. If travel through an impacted area is unavoidable, allow yourself plenty of extra time to reach your destination, check our website for the BEST time to travel and get the latest highway information by calling 511. If you have ever have had to move or have bought or sold a house, you know how demanding it can be. Now imagine having to do this on a larger scale - in multiples. On the heels of the Legislature passing the 2003 and 2005 gas taxes, we embarked on a journey to provide relief to commuters who live on the eastside of Lake Washington. Our goal, as tasked by the legislature: to enhance I-405 to meet the needs of the ever-growing population. If you’ve ever driven I-405, you can see for yourself how complex this project is. There just isn’t much room to make necessary changes as you approach SR 520 going northbound through Bellevue. In order to make those changes, we needed to purchase some adjoining properties and help relocate those businesses or individuals. As with any project, we follow a long and diligent process to make sure that the decisions we make provide the most value to you, the taxpayer, fairness to affected property owners and provide the most relief for safety and congestion to the commuter. Just like buying a house, purchasing real estate and helping folks relocate can be quite a challenge. We have established rules that we follow to be good stewards. I am sure you can understand how this could be an emotional process for some while for others it creates an opportunity that they may not otherwise have had. On the I-405, corridor, 155 business and residential relocations were needed to improve this vital roadway. We used a cost-effective consultant to visit each business or property owner individually to provide a relocation plan. Washington’s Relocation Assistance program includes an appeal process for those needing to relocate. For this corridor project, only nine individuals went on to the next step of disagreement (approximately 6%). One individual out of that nine went on to pursue the entire appeals process. Whenever you‘re dealing in real estate and relocation, there are times when a party is looking for a higher number. To ensure impartiality, we took the next step and sent this appeal to a third party, the Federal Highway Administration (FHWA). In 2009, the FHWA agreed with the decision on compensation that we provided the individual. They provided good recommendations in the consultant oversight process. We immediately added the FHWA recommendations to the state’s Relocation Assistance program in order to refine and clarify the process. During this appeal, the process we followed met the approval of the FHWA and two separate judges. The property owner’s claim was recently dismissed in April of 2011. Following the direction we are provided, ensuring the process works for the property owners, businesses and individuals we work with, and at the same time, being good stewards of taxpayer dollars is never easy. When a third party reviews and confirms that you have done it right, it really helps to tell the story. Have you even been driving down the road when all of the sudden you hear a siren in the distance or see flashing lights in your rearview mirror and immediately ask, “What is going on?”, “Where is that coming from?”, or even “What have I done?” It is easy to get surprised by an emergency vehicle and even more important to know how to respond quickly as this teen found out while in the car with her dad. Your reaction, however, could help save a life. When an emergency vehicle is approaching, pull as far to the right as possible and stop until the vehicle safely passes. If you’re on a two-lane road, at an intersection or stuck in gridlock, yield the right-of-way as best as possible to give the vehicle room to get past and keep intersections clear. If there is no safe way to pull over and stop, slow down to at least 20 MPH under the posted speed limit, or 5 MPH if the speed limit is already 20 MPH or less, and let the emergency vehicle go around you. When you happen upon an emergency vehicle on the side of the road with their lights flashing, this is not the time to try to get a closer look at the action. Slow down, stay focused to watch for emergency personnel in the area and keep your distance until you’ve safely made your way past the scene. To get to emergencies without delay, ambulances, fire trucks, police and other emergency vehicles depend on the cooperation of other roadway users. Keep these tips in mind the next time you hear a siren squeal to do your part to support these lifesaving heroes! Two contractor crewmen on I-90 were the right guys in the right place Thursday, May 5, when they ran to help a motorist having a heart attack in morning rush hour. 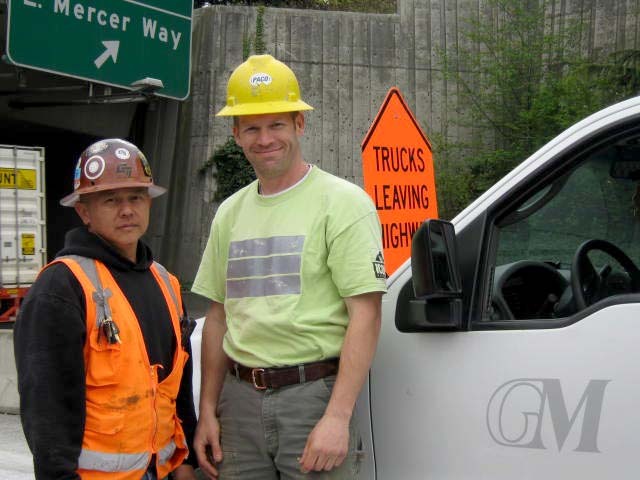 Gary Merlino Construction workers Kirk Whalen and Glen Palacios likely saved the man’s life because they knew exactly what to do and didn’t skip a beat, according to the State Patrol. They were working on a storm drain in the freeway median about 8:30 a.m., when they saw a green Toyota Corolla hit a Jersey barrier on Mercer Island. They found the driver unconscious and immediately pulled him out of the car. When they lost the man’s pulse, Whalen positioned him and cleared his airway; while Palacios started chest compressions. Both were trained and certified in CPR – Whalen as an EMT and Palacio as a U.S. Air Force firefighter. "I heard him kind of breathing, but it was more of a gurgle," Whalen told the Seattle Times after paramedics rushed the man to Overlake Hospital in Bellevue, where he was stable Friday afternoon. Merlino Project Engineer Patrick Hafferty said the driver was lucky that two people as well trained as Whalen and Palacios were at the scene and ready to help. Merlino requires foreman to have company-provided first-aid certification, but it’s not uncommon for laborers like Whalen to obtain emergency and medical training outside of work. What to do was never a question, Palacio said. "If you are trained and have the opportunity to use that training, why not if it's going to save a life?" A unique roadside feature greets drivers that cross the I-5 Interstate Bridge from Portland, Ore. into Vancouver, Wash. – a huge flowerbed shaped like Washington, welcoming them to the Evergreen State. 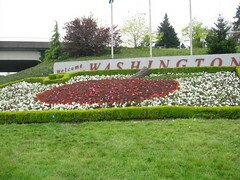 For years the “Welcome to Washington” flowerbed/sign was meticulously planted and maintained by Vancouver-based employee Sharon Morgan. Every year she designed beautiful plantings that made the sign a living work of art and a pleasant sight for everyone who traveled northbound I-5 in Vancouver. When Sharon retired in 2007 and the maintenance budget was cut back, the sign didn’t get planted for the first time in a long time. And boy, did we hear about it. Drivers were upset that the famous sign wasn’t being kept up. Our Environmental team planted the flowerbed with a sustainable and perennial design of native northwest plants. Most things were planted in the fall so they could winter over and bloom in the spring. The plants didn’t look like much that winter – some drivers thought the sign looked weedy and unkempt. Then a well-meaning citizen took it upon themselves to mow down the “weeds” without knowing that the native plants were poised to bloom in just a few months. Many plants died, so our crews removed everything down to bare dirt, and we all wondered – what do we do now? Enter Vancouver resident Yvette Golemo, who contacted Roadside Maintenance Supervisor Bill VanAntwerp and asked about the Adopt-A-Highway program. Yvette wanted to know if she could adopt the “Welcome to Washington” sign. Bill was happy to bring Yvette and her volunteers on board, and in 2009 the sign was once again planted in all its glory. Volunteer groups have planted the sign ever since. This year, we are working with the Washington State University Master Gardeners program (insert shameless Cougs plug here). The Master Gardeners grew all of the flowers and herbs we purchased for the planting; proceeds go to support Vancouver-area charitable programs. Volunteers with the Master Gardeners program are planting the sign this Saturday in the shape of a state icon – a shiny red apple. 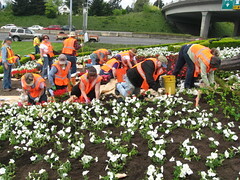 Thousands of brightly colored petunias, begonias and salvia plants will be combined with alyssum, sage and parsley to create another living work of art along I-5 in Vancouver. Sharon would be proud. Big thanks to the generous volunteers who are helping keep Washington a beautiful and welcoming state! Everyone knows that traffic crashes kill tens of thousands of people each year in the United States, most of which could easily be prevented. A recent Foundation survey found that even amidst the calls for smaller government and decreased budgets, Americans are supportive of government involvement when it comes to improving roadway safety. And while the number of US traffic fatalities has declined in recent years, traffic safety remains a major health issue both in US and around the world. Have you ever stopped to think about how many people around the world die in traffic accidents each year? Every six seconds someone somewhere is killed or injured on the world’s roads. Road traffic accidents are among the top ten causes of death around the world, claiming 1.3 million lives every year—that’s three times the total number of traffic deaths in the U.S. over the past 10 years (411,574 fatalities from 2000-2009). The younger you are, the higher your odds—the number one cause of death among young people worldwide is roadway accidents. That’s why the United Nations is launching the Decade of Action for Road Safety with the goal of stabilizing and then reducing global road deaths by 2020. Today, May 11, 2011, events are taking place on every continent to kickoff this worldwide initiative. Former U.S. Transportation Secretary Norman Y. Mineta, NHTSA Administrator David Strickland and CDC Director Thomas Freiden will join the ranks by voicing their support at a press conference on Capitol Hill this morning, reaffirming the need for all of the nation’s highway safety agencies to adopt “Toward Zero Death” goals over the next 10 years. But this isn’t just about lowering the number of lives lost on roads around the world. This is about a universal change in safety culture. This is about communities, cities, towns and countries working together to make our roads safer, to protect one another. We must go beyond single-solution thinking toward more strategic, broader reaching goals. There is a need to place a higher value on human life as you travel, be it your own, your neighbor’s, your family member’s or someone you’ve never even met. These are issues the Foundation continues to highlight with our annual safety culture survey and through discussion within the transportation community at events like the Traffic Safety Culture Summit. This is about taking a pledge over the next decade to elevate road safety to the upper echelons of global causes. Where will you be in 10 years? Hard to say, but the better question is how safe will your roads be? Act now. Just a few short weeks ago, we held our annual Worker's Memorial to honor our fallen workers and remind everyone about the importance of work zone safety. This event leads into our Give 'em a Brake program, the marketing effort to encourage safe work zone driving. The men and women working to improve your highways work just feet from live traffic, from inattentive drivers. Two of those workers were hurt within five hours early May 5. Just after midnight, a vehicle struck one of our trucks that was parked on southbound Interstate 5 just south of Interstate 90 in the Seattle area. The car then fled the scene. Less than five hours later, a vehicle hit another one of our trucks on I-5 in the Chehalis area. Both employees were taken to the hospital, but are okay. What were these employees working on? The first was part of a striping crew, adding a fresh coat of reflective paint to make it easier for drivers to see the road. The second was sweeping the highway. They were both protected by truck-mounted attenuators (TMAs). You can see a photo of the damage done by one the cars here. Our workers improve road conditions and expand roads, keeping traffic and the economy moving. Do your part – give 'em a brake. Slow down and pay attention when driving through a work zone. Find more work zone driving tips.